478. 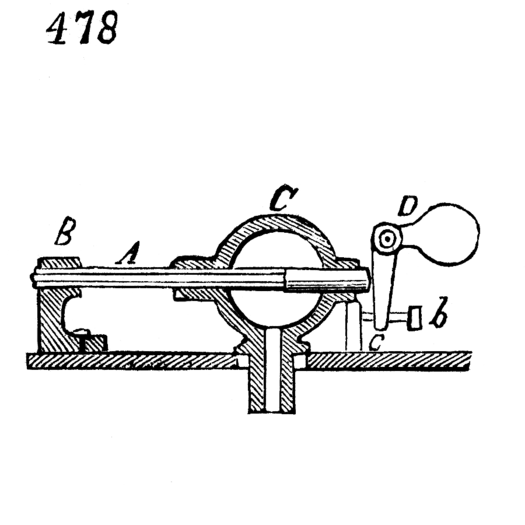 Another steam trap (Ray’s patent). Valve, a, closes and opens by longitudinal expansion and contraction of waste-pipe, A, which terminates in the middle of an attached hollow sphere, C. A portion of the pipe is firmly secured to a fixed support, B. Valve consists of a plunger which works in a stuffing-box in the sphere, opposite the end of the pipe, and it is pressed toward the end of the pipe by a loaded elbow lever, D, as far as permitted by a stop-screw, b, and stop, c. When pipe is filled with water, its length is so reduced that valve remains open; but when filled with steam, it is expanded so that valve closes it. Screw, b, serves to adjust the action of valve.